This won't come as a surprise to anyone who knows me, or has spent more than a few minutes reading the blog. So don't everyone all gasp at once when I say: I am not a punk rocker. I might be a rocker. But a punk rocker is a whole different game, and it's not one I ever wanted to play. Anyone raised on the mellow, mellow grooves of El Lay music, like I was, cannot be a punk rocker. Or maybe if you were raised on those mellow, slickly-produced grooves, but then felt the need to totally rebel against the preceding generation, kick out the jams and shove safety pins in your cheek, you could be a punker. That wasn't me. 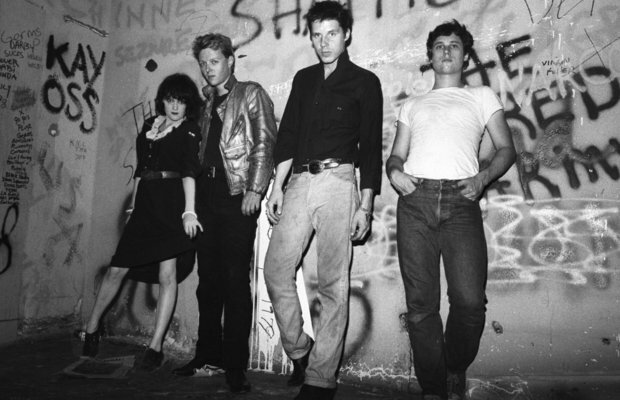 But then, there's X. I love X. X came out of the early, early days of the L.A. punk scene, and as some would argue, were at the forefront of the entire punk movement, New York and CBGB's be damned. X might have been pioneers on the Hollywood/L.A. front, but by the time I discovered them, they'd moved beyond fast, true “punk” music into something with deeper roots in American music. Their guitarist, Billy Zoom, has always looked & played rockabilly, and their music always had a deep vein of rockabilly/country at its core. With Ray Manzarek from The Doors producing and playing keyboard on their first album (and their cover of “Soul Kitchen”) it seems clear that X was always more about being part of an ongoing musical story, a new chapter in American music, rather than about burning up the existing books and smearing the ashes on their faces. Make the music go bang! Bang Bang, Make the Music go Bang! they might have told you that it sure sounded like "punk rock" to them. On a gut level, I knew that John Doe and Exene were smart. They were writers, they were poets, and they'd even met at a writing class, at a place called Beyond Baroque. At the time, I dreamed of someday going to Beyond Baroque and hobnobbing with cool, punker-poet types. I've never made it there, yet. While I was doing some 'net research to write this post, I stumbled upon a couple of exciting facts. Number ONE, is that Exene has moved back to Southern California after living in the midwest for a number of years. And, she's settled down in my old hometown of Orange. (Reason #148 to beat myself up for moving away from there.) And TWO: Just for shits and giggles, she's been playing some music sets, along with a few other members of X and folks like Phil Alvin, in a new & vintage clothing store in Old Town Orange, called Moonlight Graham. 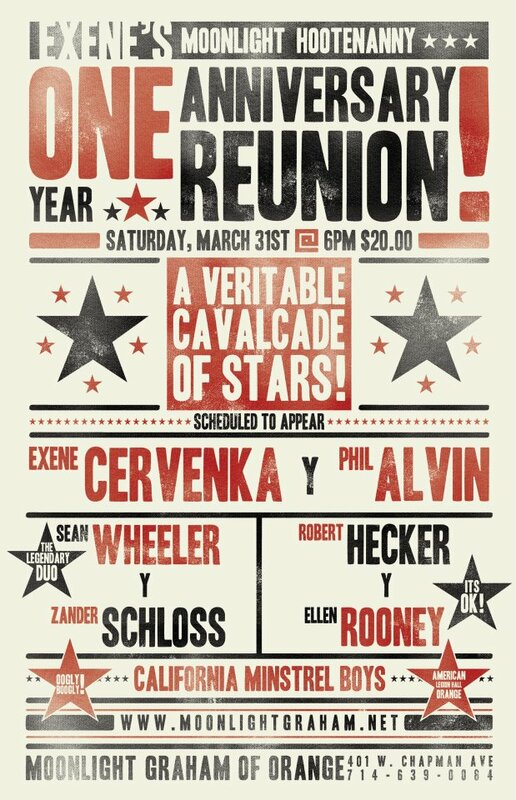 And, they're playing an anniversary show THIS SATURDAY (like, tomorrow). 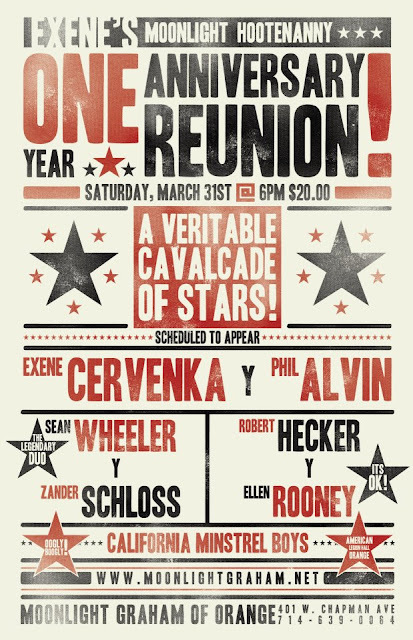 When I found out about this show, I immediately clicked the link to buy tickets. But then I checked the calendar and realized it just couldn't happen, as we have other plans for this weekend. DAMN. But I was also sort of relieved, as I'm not sure I'm worthy to be in such a small venue, breathing the same air as Exene. I'm totally not worthy. Also, I was a bit embarrassed that one of my other immediate thoughts was: What will I wear?? See. I'm so not punk. Here's the video for "The New World." It's grainy, and the lip-synch is off, but it's still worth watching. John Doe has never looked cuter, Exene has never looked hotter than in her cowboy hat and midriff-tied shirt. And the song, released in 1983, is just as timely today: "Honest to goodness, the tears have been falling all over this country's face." Enjoy! And have a rockin' Friday. I don't know about you, but what's with all the school breaks these days? For instance, my kids got a full week off at Thanksgiving, three weeks off for Christmas break this year, a four-day weekend combining the President's birthdays, and now, two weeks off for Spring break. Sheesh! (That's not to even mention the various other Monday holidays, and “staff day” Fridays.) With the long Winter and Spring breaks, it becomes fairly imperative for me to plan a family getaway, even if it's just for a few days. Previously, I detailed our quick two-day trip to San Diego to kick off the new year. (That was during week 3 of Christmas break.) For Spring break, I have another quick getaway planned. But since that one is still in the future, I thought I'd share my tips and ideas for another local getaway that we've done on past spring vacations: Palm Springs. Now, there are plenty of big, sprawling (and expensive) resorts in neighboring desert towns, such as one featuring a “Splashtopia" pool area. 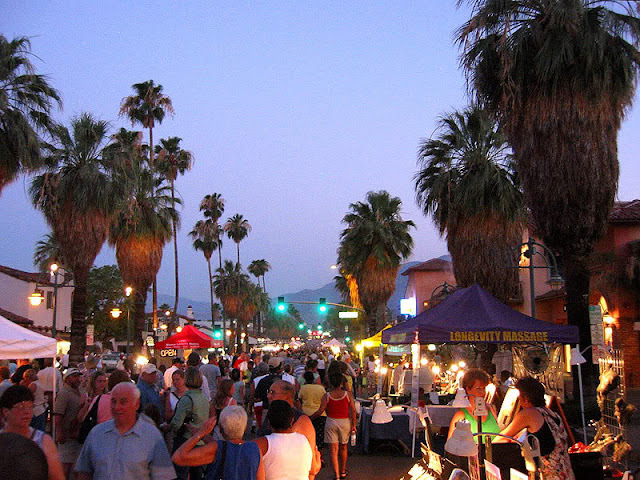 But personally, I like the funky charm of downtown Palm Springs proper. And, I'm also trying to stay on budget – reserving our bigger, longer, pricier family trips for during the summer. So here goes my little trip report for Palm Springs with kids. It's a combination of several trips we've done, so my kids appear at various ages. Day 1: I highly recommend trying to your plan your arrival in town for a Thursday afternoon. This, so that your family can walk around and enjoy the weekly VillageFest that takes place every Thursday evening. (You don't want to drive in during the middle of this, as a long stretch of busy Palm Canyon Drive is closed to car traffic.) VillageFest is a street festival in the heart of downtown. There are vendors selling crafts and jewelry, musicians, food booths, and a small farmer's market at one end. The whole vibe is very celebratory, and it's great people watching. My kids enjoy the hustle-bustle, stopping to watch the musician's play and hawk their CDs, and getting snacks. It will also give you a good introduction to the many shops and restaurants in town. Village Fest photo from here. At some point, you'll need to check into your hotel. I recommend, for price and location, the Palm Mountain Resort. This is the place I choose to stay when traveling with kids –when we do a couples-only, romantic getaway to the desert, I stay at entirely different types of hotels. But that's another trip report entirely. The Palm Mountain Resort is a two-and-a-half star hotel in my book: the rooms are spacious, clean and adequate, if somewhat dated. The great thing about this place is the location, which is in easy-peasy walking distance (yes, even with small kids) of the downtown stores and shops. I recommend paying slightly more for a balcony/mountain view room. You wake up and everyone is hungry. Walk across the street, through a business parking lot, and you'll enter into the plaza that houses a Ruby's Diner. Good, affordable breakfasts, and the kids will enjoy watching the electric train that's (usually) running around the perimeter of the ceiling. They also have lots of outdoor patio seating. After the hike, the kids will be whiny and begging to go back and play in the hotel pool. And that's what you'll do for the rest of the afternoon. Hopefully, you can squeeze in some naps and/or quiet time before heading out to dinner. Let's assume you're staying three nights. We live very nearby (less than two hours away), so often we only stay for two. This would be check-out day already for us, but it's Saturday, and you're in town for another full day. For breakfast, you can walk across the street again to Ruby's Diner, or you could walk a little bit further, to a side street and the fun that is Pinocchio's. Now, I've only been here on Sundays for their bottomless champagne brunches, but I imagine the scene is just as lively and happy here on Saturday mornings as well. Do everything you can to eat outside, on the noisy (covered) patio. Service runs a little slower here, but it's worth it. Take the aerial tramway up the side of the mountain. The journey is the whole point on this...once you get to the top, admire the amazing views of the Coachella Valley and the mountains. Maybe hike around a bit in the woods. Bring a sweater, it'll be chilly. Then you get to have more fun, coming back down again. It's a little hairy, and the trams now spin (slowly) to allow a 360-degree view. Still, be aware in case anyone suffers height/motion sickness. Go to Knott's Soak City, a sprawling water park. My kids have been too young on previous trips, and personally I'm a big chicken when it comes to tall, twisty slides. But you might very well think this is a blast! Visit the children's museum in Rancho Mirage. I have a good children's museum in my own town, but I've read excellent reviews on this one. Perfect if you have little ones who need to be let loose in a “go ahead and touch everything” kind of place. Personally, I'd take my kids back to the Living Desert, in Palm Desert. Again, this is a perfect springtime destination, as it's just too hot to stroll around and enjoy this during the summer months. (Remember, by July, the temps climb to well above 100 degrees.) The Living Desert has wild animals, a new Discovery Center, a really cool model train set-up, and a desert-themed playground. Perfect for expending lots of energy. End your day by remaining in Palm Desert and catching dinner at The River, a “shoppertainment” type of outdoor mall with a fake, but lovely, “river” running through. Eat dinner at the Cheesecake Factory or The Yard House or one of the other similar franchise choices. Also, on one of our shorter trips, we've left town and crossed north over the 10 freeway to the small town of Morongo, in the high desert. There we've hiked at the Big Morongo Canyon Preserve, an area with a small creek and marshlands. There are several easy hikes, on a well-paved “boardwalk” sort of trail. It's very quiet out here, and a little cooler than Palm Springs in both spring and summer, and a good way to end your day. Just remember to bring adequate water, drinks and snacks along (there are a few small stores in the town of Morongo). And that's it! Time to go home. Stop at Hadley's for another (or your last chance) date shake, and to buy packs of dates, nuts or taffy for the ride home. I'd love to know if you try any of these out, or if you have other tips for places to take your kids in the area. Adios! For this Friday's installment of my L.A. music series, I'm giving you some Beck. This, because I'm still pretty excited about procuring my lovely wood back on Monday. My vintage credenza came from a Craiglist seller in Silverlake. Beck lives (or used to live) in Silverlake. As I also explained on the same wood-centric post, Silverlake is a area near downtown L.A. that's an enclave of hipsters and creative types. The song I'm playing today is "Que Onda, Guero?," off of his album "Guero." I love this song because it reminds me of working in a semi-industrial area of Santa Fe Springs, back in the very early '90s. I had an office job for a small distribution company, owned by a Mexican-American man named Gil. Gil was shocked to learn that his new secretary (me) was half Mexican, too. He'd just assumed that because my name is Kelly, that I must be Irish. Ha. Anyway, that whole neighborhood (like all of L.A.) was a big melting pot of races, but especially Mexican-Americans. At snack and lunch time, the roach-coach (food truck) would park at the end of the cul-de-sac, blare it's horn, and the workers from all the nearby companies and offices would come out for fresh-made burritos, tacos, ceviche, and packaged Hostess snacks. "Que Onda, Guero?" translated literally means, "what's up, blonde-boy?" (Also: important to know that "guero" is pronounced "weh-doh," as you'll hear in the song. But "guero" in casual Mexican parlance really refers to any white boy, no matter the hair color -- or a pale-skinned Mexican, too. Hence my sometime-nickname around the office of "geura," for the supposed Irish girl who was really just a half-breed with dyed auburn hair. So here's to Silverlake, Beck, being a guera, and gettin' your groove on for the first weekend of spring. Turn it up and enjoy! I'm linking up with Jules at Pancakes and French Fries every Thursday as part of her 2012 William Morris Project. A couple of weeks ago, I got sucked into the vortex of the playroom. See, even though the kids received a bunch of new games and toys and Crayola Glow-things for Christmas, and even though I'd never "officially" found new homes for these things, I was living under the very mistaken notion that the playroom was really "not that bad." The playroom is a small room right off the entryway, adjacent to the living room. It used to be solely a very small guest room. Then I took stock and realized we very rarely had guests, and the space was going to waste. So for the last several years, it's a "play room." Which really means, the kids store toys and crafts and games in here, but drag them all out into the rest of the house. And then I round it all up and throw it back in here. The room also has a small Ikea futon that opens up into a full-sized bed, for our occasional guests (usually my mom or sister). See, when you walk in...it doesn't look all THAT BAD. This armoire holds kid sweaters and jackets, and also gives guests a place to hang their clothes. It's getting rickety, after years of kids slamming its doors and cramming inside to pretend it some kind of Narnia-wardrobe portal. The bottom holds games, which hadn't been weeded out in a few years. The narrow top part was crammed with old dress up clothes and more games. More than the other cleaning projects I've tackled this year, I found this project emotionally draining. It's hard to realize the kids have outgrown beloved games and books. It's hard to get rid of dress-up clothes that no longer fit. It's hard for me to man up and admit that I hate to do crafts with my children. Don't even ask: an unopened gift from 2009. Also, I thought I could go in, fuss around and clean for an hour or two, and call it done. I had Annoying Oranges, to mock me and keep me company. And small furry Zhu-Zhu pets, the hot toy of 2010. (At least they aren't real hamsters.) The Zhu-Zhu's have left the building. They're now in a box out in a garage. If no one remembers or asks about them in the next several months, they're goners. This was just half of the pile that was donated: old games, puzzles, books and dress up clothes. My weird kids have always been terrified by "Operation." The computer where the kids do school research and play some games. We keep it very locked-down. Seasonal, Christmas crafts supplies are in the baskets above. The artwork is from a postcard set from Disneyland featuring artist Mary Blair (she was the designer of "Small World," to name just one project). I love that all this art isn't nailed to the wall, and can be swapped out whenever the mood strikes. Cleaning out the playroom took the better part of a week. During that time, the donate pile sat outside the door, in the living room. The room was half-done for days and days. It was a constant irritant, like sand in my bathing suit. But now it's done. It's just turned spring, but it feels like I'm finally, fully in the "new" year of 2012 now that the Christmas toys have found homes. So, happy spring...and Happy New Year. I know it's Tuesday already, but how was your weekend? It was rainy, cold and windy here, but instead of enjoying a lazy time on the couch with a book, I was plopped in front of the computer. All weekend, I was trolling for wood on Craigslist. Quality wood, wood with a patina of years and experience. Big wood, because size definitely matters. Wood that you just want to put your hands upon and stroke. But you'd be amazed at how folks on Craigslist describe their very boring, very standard wood as something of quality, when really it's just some nasty, grimy wood indeed. I'll get my mind out of its nasty little gutter and enlighten y'all. For the last month or so, I've been cruising the 'net, shopping for a large credenza or dresser for our family room. A mid-century piece, with classic, clean lines and peg legs and a smooth, not-too-scarred patina. I've loved this style for a long, long time, way before it was hot and trendy and “Eames” was a throwaway adjective used on Craigslist and Ebay to describe just about any crappy piece of furniture. The purpose of the credenza/buffet/dresser is to hold our new mega-TV, purchased back in November. It's 55", which is still smaller than the 60” beast my husband initially dreamed of (because size matters to guys too, especially when it comes to electronics). When the new TV was installed, it was shocking how big a 55” screen looked in the room. Watching the local news, I felt like “Who are these people and what are they doing in my house?” But after a few weeks, we got all blasé and used to the size. But it's still big. So big, that it does not fit into our existing media monolith. See how the left edge blocks the glass bookshelf, and the top edge blocks shelving. Our family room has this rather deep nook. It's so deep, that it cancels out the popular thing to do, of installing your big flatscreen television up on the wall. Because the nook is so deep, it would make even our big screen too far away...and also make it difficult to see unless you're sitting straight-on in front of it. The nook is 82” wide (what's that, about 7 feet?) and about three feet deep. We'd bought this media unit from Ikea long before we moved into this house. It just happened to squeeze into the nook almost perfectly, after my husband removed the side baseboards. It's tight, but it fits, and most people who visit for the first time and pay casual attention to the space assume that it's a built-in. Unit pulled out; see the depth of the nook. But the new TV didn't fit into the space allotted for televisions, unlike our old TV, which fit just perfectly. Sooo. After long, boring talks about dimensions and solutions and Ikea this and Ikea that, and my husband seriously campaigning to build something difficult and custom, I came to the firm conclusion that only a nice, clean-lined credenza would do. It didn't actually have to be a vintage piece, but after browsing online and seeing what I could buy new, from retailers like Design Within Reach for a mere, oh, $2,500, it was obvious that a non-pristine, vintage specimen was the solution. Currently "on sale" at DWR for about $2,500. Thus ensued my constant trolling, checking online in the mornings and evenings, using a variety of search terms, and viewing some very, very ugly pieces of furniture. And that would have been the end of this post, that I intended to put up on Monday: I spent my weekend looking for wood, so what's new with you? Aside: SilverLake is a very hipster area in L.A., with lots of modern homes and indie, creative types. (Beck and Parker Posey have lived there.) I saw a lot of cool furniture listed out of Silverlake, and it was all too expensive...'cuz all those young, hip trend-setters were pricing their “Mad Men” “Eames” “Mid-century” furniture at a premium. But! My seller was an older woman, not a hipster. Which was why the dresser was priced so fairly, and why she was patient and nice to deal with --- and also explains her urgent errand later in the day: because that's what older people do – they go to the doctor's. So. At the time of this conversation, it was about 10:50 am. My husband works from home, and he was immersed in his work. I hung up the phone with the seller and told him: YOU NEED TO GO. NOW. RIGHT NOW. (I mentioned that we're close to 100 miles away, right?) (And there is this phenomenon in Southern California called: traffic.) My husband needed to be the one to fetch the piece, because we weren't 100% sure it would fit into my mid-size SUV...and if not, he was taking ropes to tie down the rear door. Something I cannot be trusted to do effectively. Otherwise: broken, vintage wood all over the freeway. Luckily, we had enough cash in the house for once, so he didn't have to stop at the bank. Luckily, I had just enough gas in my tank to make it, so he didn't have to stop to fill up. Luckily, there were no traffic incidents on any of the 5 freeways he traveled to reach my wood. The seller called again, as he was leaving, to repeat: “I really need to leave my house no later than 1pm! Can your husband make it?” And I said, “uhh...sure!” And I said again to my husband: GO. GO. GO. As it got closer to 1pm, my heart started to race and I started pacing around the house. My husband had left around 11:10...would he make it? A few minutes after one, the phone rang. Caller ID showed it was him. I prayed he wasn't calling to say... “well, I'm stuck here on the freeway...” But he said three magic words: I've got it! 72 inches of quality wood, baby. Or as the husband sums up all the impending work on the credenza: "I have to massage the wood." Right. Bah-dump-pah! And that is why we're such a good pair. Us with our minds in the gutter. We got wood. Heh Heh. For my very first installment, I'm talking about Waddy Wachtel. Earlier this week (maybe the same night I got the urge to listen to music) my family was sitting around the dinner table watching Palladia, a music channel that features lots of concert footage. There was my girl Stevie Nicks, singing "Landslide," and there playing lead guitar was a familiar-looking dude with crazy long, blond curly hair. "WADDY!" I yelled. Who? !, asked my family "That's Waddy Wachtel," I said, getting all fired up as I do when I'm talking about music dear to my heart. Waddy Wachtel is a guitarist, a session musician and back-up singer who played with just about every major artist coming out of the L.A. scene in the early to mid 1970s: J.D. Souther, Jackson Browne, Karla Bonoff, Warren Zevon, Buckingham-Nicks (first band of Lindsey Buckingham and Stevie Nicks), and Linda Ronstadt. To name just a few. The reason I know Waddy's name is that I spent hours and hours of my girlhood listening to many of those same artists, but none more than Linda Ronstadt (who deserves and will surely get her own separate post in my series). And when I wasn't warbling along to every song, I was busy reading the liner notes of the albums (because yes, I'm that old). And listed as a session player, over and over, on album after album, was Waddy. 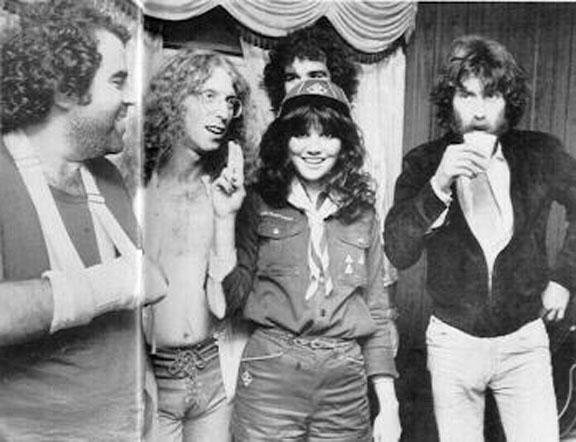 I love this pic: Waddy to the left of Linda, J.D. Souther on her right. According to his Wikipedia site, Waddy (sorry, have to call him by his first name), has toured as member of Keith Richard's band, the X-Pensive Winos, and is currently the lead guitarist and musical director for Stevie Nicks (which explains the Palladia segment). And God bless Wikipedia for also cluing me into this awesome fact: Waddy was one of the band members filmed playing as the boat capsizes in the Poseiden Adventure. Enjoy. And have a rockin' Friday. Mary Karr rocks my world. I mean, I think of her in the way I used to think of Bruce Springsteen – a lifeline, an emissary from another world sent here to save me. Just me. Forget all those legions of slavering fans. Forget all the critics and their words of lavish, superlative praise. Like the best kind of inspiration – it's all about me. When I was sixteen, seventeen, and beyond, I listened to the music that was hip in my circle. I woke each morning to my clock radio, and the English accent of DJ Richard Blade on KROQ, back when KROQ was cutting edge (do any radio stations matter anymore?). I listened to (and liked) The Cure, The Smiths, Tears for Fears, Pet Shop Boys, Marc Almond and Soft Cell. All those skinny, fey, sensitive English boys with their black nail polish. But alone in my room, away from friends and their strict censure on what was cool, I listened to Bruce late into the night, and dreamed of escape. Whatever word pops into your mind when you hear “Bruce Springsteen,” (patriotic, American, blue collar, corny), the thing that pops into my head is: unabashed romantic. All you really need to know about Bruce the Romantic, and my own deep-seated love of Americana, the open road and the urge for transcendence, is in the opening lines of "The Promised Land:"
But pretty soon, little girl, I'm gonna take charge. And I believe in a promised land. But this post isn't about Bruce. It's about me, in the dark. Back in high school, it was the literal dark of my bedroom and listening to the sound of hope, taking to heart the line about the passenger door being wide open, and all I had to do was climb in. 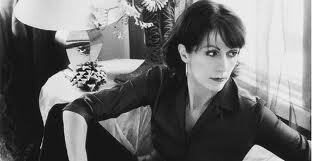 And now I'm a lot older, and the voice in the dark, my figurative dark of struggling to pass as a responsible, well-adjusted citizen and parent, is writer Mary Karr. With her trio of memoirs recounting her dramatic childhood (The Liar's Club), her drug-addled, frustrated and lonely adolescence (Cherry) and then her adult struggles with alcohol and the demons of her past (Lit), Karr continues to be not just a mentor and inspiration for my writing self, but also a sort of lifeline, an extended hand by which I can pull myself out of the muck of my own past and figure out how to deal with it. Not just on the page but...really deal with it. I think all writers and artists and creatives need mentors – someone to look up to, someone who's gone before and blazed a trail. A path of breadcrumbs to follow, before you can strike out and make your own path (just to nail down that metaphor). As a college student, both undergrad and graduate, I never encountered that mentor. I was taught by some wonderful, charismatic male professors who vibrated with a love of good books – but that wasn't mentoring. (I also had a few sorry, washed-up, ego-driven professors that had to be skirted around like mean-tempered dogs.) But a woman writer, professor, or even, hell, just a like-minded older soul that I could emulate and maybe leech some life wisdom out of – that woman never (and hasn't yet) crossed my path. So, I've got Mary Karr. How to explain the feeling of recognition so strong that it's a form of relief, to read what I've known and experienced all my life, elucidated there in black & white on a page? Yes. Karr's sense of being perforated as a clip-out coupon mirrors my own metaphor that I feel around my own so-called peers and the chatty members of the local PTA: of being a busted vase, barely held together by Super-Glue. The cracks might not be visible, but they're always present. And on bad days, that Super-Glue feels more like tape that's barely sticky enough to keep me together. Re-reading Karr lately reminds me that I need to get back to it – my writing, my own memoir that I've written out long-hand on yellow legal pads. It's fearsome work, which she acknowledges: "The emotional stakes a memoirist bets with could not be higher, and it's physically enervating. I nap on a daily basis like a cross-country trucker." Reading her 2009 interview in The Paris Review again this week, I take heart that I'm on the right path. According to the interview, she's working on a memoir-writing textbook – which you best believe I will gobble up like Reese's Pieces when and if it's published. I also have the memory of seeing her speak at the Los Angeles Public Library nearly a decade ago. She came out onto the stage, a petite, dark-haired woman in a killer pair of black stilettos. I don't remember most of what she said, but this line sticks to me: when asked if she worried about what her family would think of her, exposing them in The Liar's Club, Karr responded in her Texan drawl: “Who else is gonna go down and have dinner with those people?” Which is what I try to hold onto, when I envision the weepy disavowals that will surely come my way if my own story ever makes it into the world: Who else is gonna have dinner with those people? If I ever meet Mary Karr in person, I'll likely either be struck dumb and dumber ("er...I really, really like your work...."), or be so starstruck that I'll puke all over her expensive shoes. So this post is my fan letter, to my own personal rock star. I'm holding up my Bic lighter way out here in the cheap seats, Ms. Karr. Rock on. Tomorrow my daughter, my first-born, will turn 10. It's such a big number...the very first foray into the double-digits. A decade of Lily. A decade of being a parent, a mother. No big party is planned, just a trip up the freeway to Farrell's Ice Cream Parlour for a sundae and a fuss with drums and singing waiters. That's her choice, that's what she wants most. Easy. Her new room was all ready. Diapers were bought, clothes and blankets and tiny washcloths were washed in Tide Free and folded neatly in drawers. (What's funny is that the blanket folded over the crib is now her much-beloved "blankie" that still must be in bed with her every night before she can fall asleep.) Empty crib, silent house. Waiting, waiting. I read poetry books given to me about labor and birth and early motherhood. There were lots of metaphors about dawn breaking, the sun shining on a new world, etc. And then, she was here. ...and all of us, mom, dad, and Lily, have grown and changed and aged and morphed with the years. Happy 10th Birthday to our little family, and to our amazing, shining girl. I'm linking up with Jules from Pancakes and French Fries for her 2012 William Morris Project. I've been wanting a terrarium for a long time, so I made a terrarium. I'm not really a crafty, DIY kind of person (well, I'm DIY when it comes to painting walls and assembling furniture and copying others more creative than me). And I certainly don't have a green thumb. So anyway. Here's my terrarium of succulents. I left out the big green one -- it felt like it would be too crowded in there. I'm also not sure what to think about that crazy guy with the curly leaves spilling everywhere. (It reminds me of my own hair: curly and too big). Not sure if it's going to be allowed to stay, but for now it remains. From the beginning, this project was intended for the kitchen island. I never know quite what to put on the island -- usually it's a bowl of fruit. Very occasionally, it's a vase of fresh flowers. I've often used this big glass bowl (from World Market) in the past. It's held river rocks and candles and even red and green crystal rocks during the holidays. Anyway, the island seems to call for something not purely decorative, and yet not just a small, functional bowl of bananas, either. Enter the terrarium. I won't tell you how to make your own, because the information is all over the web. And also, I don't want to be mistaken for somebody who knows what they're doing. (Regarding terrariums or pretty much anything else.) I did read that succulents require full sunlight, which they're not going to get here in my kitchen. That said, I've had several types of succulents around the house before that don't ever receive full sun, just bright indoor light, and they seem to do fine. So there you have it. Terrarium. Voila!